Factory Sealed 2013 Topps Tier One Baseball Hobby Box MLB mit 2 Cards per Pack. 2 Autogramme & 1 Relic Card per Box ! 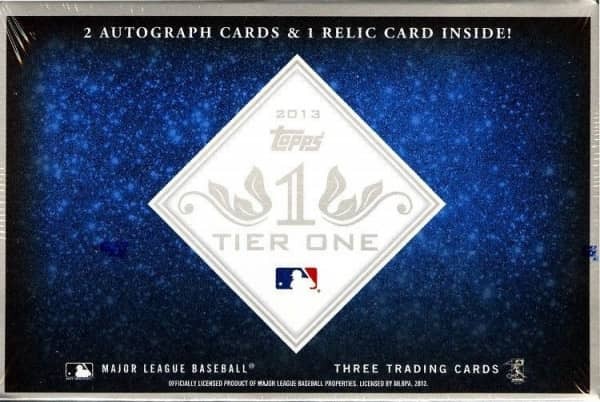 Produktinformationen "2013 Topps Tier One Baseball Hobby Box MLB"
Look for ALL NEW Dual Autograph Relics, 1/1 Autographed Bat Knob Cards, and 1/1 MLB All-Star Game Crown Relics!! Every 4th Box will contain a BONUS Relic Card! Every single- and dual-subject autograph card is signed DIRECTLY ON-CARD! Over 20 of the best of all time will sign directly on-card. Sequentially numbered to 199 or less. Signed in blue. Over 50 young up-and-comers will sign directly on-card. Sequentially numbered no higher than 399. Signed in blue ink. Over 50 of the most popular players in the game will sign directly on-card. Sequentially numbered no higher than 299. Signed in blue ink. Red Ink Autographs - Sequentially numbered to 25. Silver Ink Autographs - Sequentially numbered to 10. Gold Ink Autographs - Numbered 1/1. 25 reprints of classic Topps cards like you've never seen them before - on clear plastic stock! Signed directly on-card and sequentially numbered to 25. NEW! Clear Reprint Autographs Over-sized Parallel: An over-sized version of some of the above cards - bigger, but still clear! Signed directly on-card and sequentially numbered to 10. 15 cards featuring classic pairings and on-card autographs of both subjects. Sequentially numbered to 25. 5 cards featuring three stars with a common bond. Sequentially numbered to 10. 25 cards featuring vintage autographs. Numbered 1/1. 25 active and retired stars featuring an autograph and a relic. Sequentially numbered to 99. Dual Patch Parallel: A parallel with two swatches per card. Sequentially numbered to 25. Triple Patch Parallel: A parallel where all three relics are patches. Numbered 1/1. 25 active and retired superstars with a jumbo patch relic and on-card autograph. Sequentially numbered to 10. 25 active and retired superstars with the end piece of a bat knob embedded in the card, with an on-card autograph. Numbered 1/1. Stunning pairings of two active or retired superstars, each with a game-used relic and a sticker autograph. Book card. Numbered to 10. Over 70 active and retired stars. Sequentially numbered to 399. Dual Swatch Parallel: A parallel with two swatches per card. Sequentially numbered to 99. Triple Swatch Parallel: A parallel with three swatches per card. Sequentially Numbered to 25. 15 retired stars. Sequentially numbered to 99. Dual Swatch Parallel: A parallel with two swatches per card. Sequentially numbered to 25. Triple Swatch Parallel: A parallel with three swatches per card. Sequentially numbered to 5. 25 active and retired superstars with a jumbo patch relic. Sequentially numbered to 10. The smash-hit cards of last year are back. More unique cards featuring a game-used bat knob from superstars both active and retired. Numbered 1/1. Cards highlighting a unique, jumbo patch piece from the 2012 MLB All-Star Game workout jerseys. Numbered 1/1. Weiterführende Links zu "2013 Topps Tier One Baseball Hobby Box MLB"
Fanbewertungen für "2013 Topps Tier One Baseball Hobby Box MLB"
Dein Online Shop für amerikanische Sport-Fanartikel in Deutschland. * Alle Preise inkl. gesetzl. Mehrwertsteuer ggf. zzgl. Versandkosten und ggf. Nachnahmegebühren, wenn nicht anders beschrieben. Wir liefern mit DHL, und UPS. Zahlen können Sie bei uns mit Paypal, Visa, Sofortüberweisung, Mastercard, American Express; ausserdem via DHL-Nachnahme und per Vorkasse.